Archbishop Chrysostomos was born in the village Statos of the Pafos district on the 27th of September 1927 and he passed away on the 22nd of December 2007. His secular name was Christoforos. A child of a poor, rural family, he first received education in the elementary school of his village, from which he graduated in 1940. Right after that he entered the “Panagia tou Kykkou” monastery as a novice, serving there for the next 6 years and at the same time attending classes in the monastery’s school. In 1946 he was sent to study in the Pan-Cyprian Gymnasium and graduated In 1950 and was appointed secretary of his monastery’s board. On the 18th of February 1951 he was ordained a deacon, receiving the name Chrysostomos. In 1952 he was sent to Athens for higher learning. He attended courses of the Philosophical and Theological Schools in the University of Athens, from which he graduated in 1961. In the meantime, Chrysostomos had assumed the administration of the Ethnarchy’s offices in Athens since 1957. He returned to Cyprus and was appointed as a Preacher by the “Kykkos” monastery. On the 29th of October 1961 he was ordained a Presbyter and later on an Archimandrite (Dean). From 1961 until 1966 he worked as a professor of theology in the Pan-Cyprian Gymnasium and in the “Apostle Varnavas” Hieratic School. In 1966 he went to England for postgraduate studies and to learn the English language. In 1968 he returned to Cyprus and on the 14th of April 1968 he was ordained as the Suffragan Bishop of Constantia. 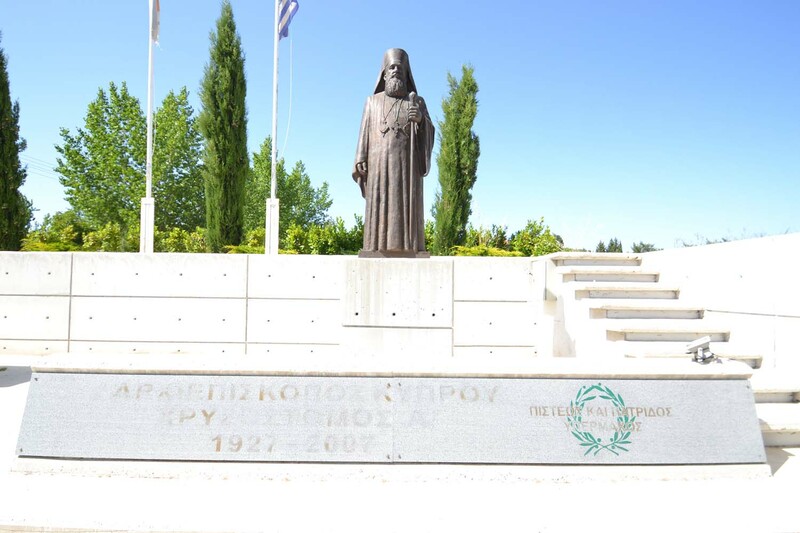 Chrysostomos decisively stood by the side of Archbishop Makarios during the critical period of 1971-1973. 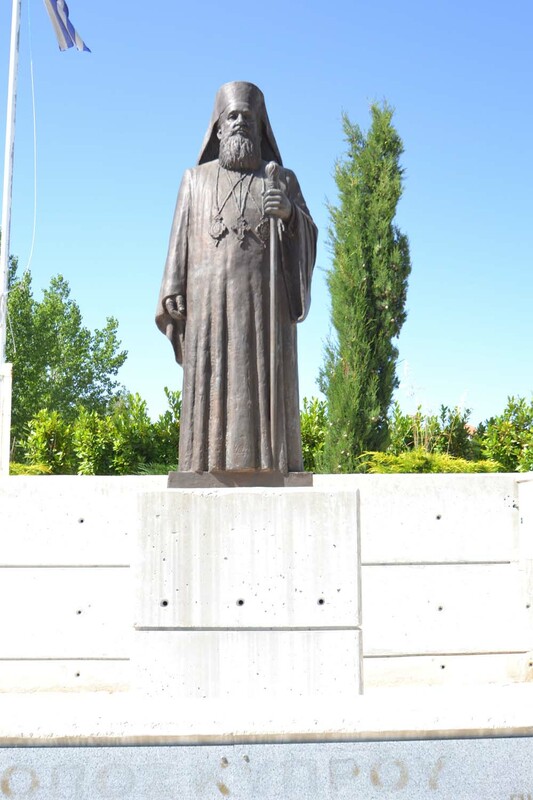 In 1973 Archbishop Makarios declared elections for the Episcopate of Pafos’s district and Chrysostomos was -by acclamation -elected as the Bishop of Pafos on the 28th of July 1973, being enthroned the next day. After the 1974 coup d’etat and Makarios’s escape to England, Chrysostomos started a struggle so as to achieve the return of Makarios. Makarios returned to Cyprus on the 7th of December 1974. After Archbishop Makarios died on the 3rd of August 1977, Chrysostomos assumed the vacant archbishopric throne as Deputy. On the 12th of November 1977 he was unanimously elected Archbishop of Cyprus and was enthroned the next day. As the Suffragan Bishop of Constantia he participated in various expeditions abroad. As the Archbishop he took part in many ecclesiastical conventions in Cyprus and abroad and represented the Church of Cyprus in international events. 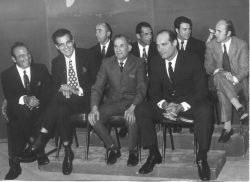 In this historical picture (from the television program hosted by Demetris Liberopoulos “innocent or guilty?”) the man in the middle in the first row between the brothers Giorgos and Aristides Roumpanis, is the runner Stelios Kyriakides, who participated in Berlin marathon in 1936 and won the Boston marathon (1946) right after the war. Stelios Kyriakidis is the most significant, modern personality of sports, having achieved international accomplishments and distinctions. He was born in the village of Statos in the Pafos District on the 4th of May 1910. He started his career in sports after his teenage years. Initially he took part in rural games, wearing the colours of his village. Later on he contested as an athlete for the ‹‹Olympia›› Gymnastic Club of Limassol, the colours of which he kept on wearing until the end of his glorious career in athletics. followed by a policeman on a bicycle. For some time he worked as an employee of the Limassol Municipality, however being appointed in 1936 as an employee of the Public Power Corporation (ΔΕΗ) of Athens – Piraeus after he had permanently settled in Athens. Stelios Kyriakidis excelled in middle-distance and long-distance racing contests, especially in the Marathon. From 1933 until 1945 he won first place 14 times in the annual Pan-Cyprian Games. He was the holder of all the records in Cyprus in the races from 1,500 meters to the Marathon. 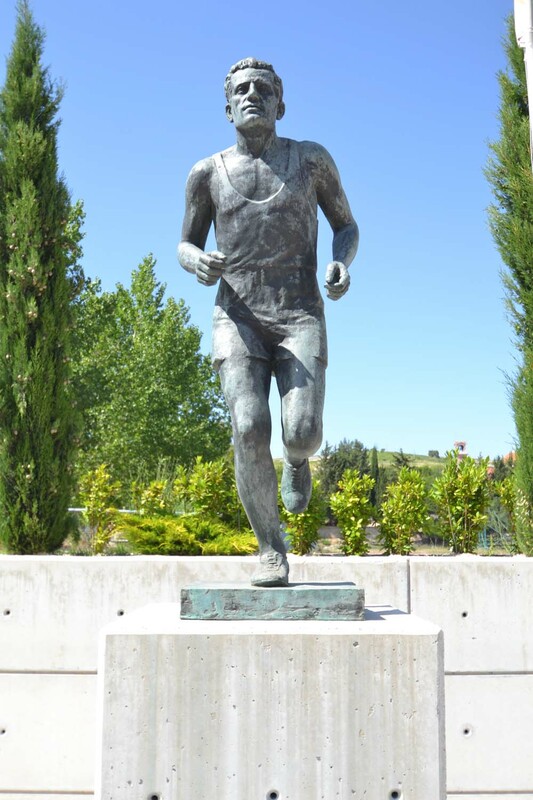 He also held the Greek records in the races of 5 and 10 kilometres, in the races of 3,4,6,8,15, and 30 kilometres, in the races of 3 and 6 miles, and in the races of half an hour and one hour. From 1934 until 1938 he won first place 10 times in Pan-Hellenic Games and from 1934 until 1939 he climbed 6 times to the top spot of the pedestal in the Balkan games: He won the Marathon of 1934, 1936, 1937, and 1939 and the 10 kilometres race in 1934 and 1936. Stelios Kyriakidis participated with the Greek national team in the Olympic Games of Berlin in 1936 and of London in 1948. He became known world-wide for his victory in the international Marathon of Boston on the 20th of April 1946 with a time of 2 hours, 29 minutes, and 27 seconds. This time of his was -for many decades -the best in the Marathon contest. Besides, his Stelios Kyriakidis’s victory in the Boston Marathon is considered one of the most important achievements of all times for Greek sports. For his achievements in sports, Stelios Kyriakidis has been honoured with the Grand Cross of the Order of the Phoenix by the (former) King of the Greeks and with other medals and distinctions by the Governor of Massachusetts (USA), the Olympic games Committee, and the Municipalities of Athens, Piraeus, Patra, Filothei, etc. 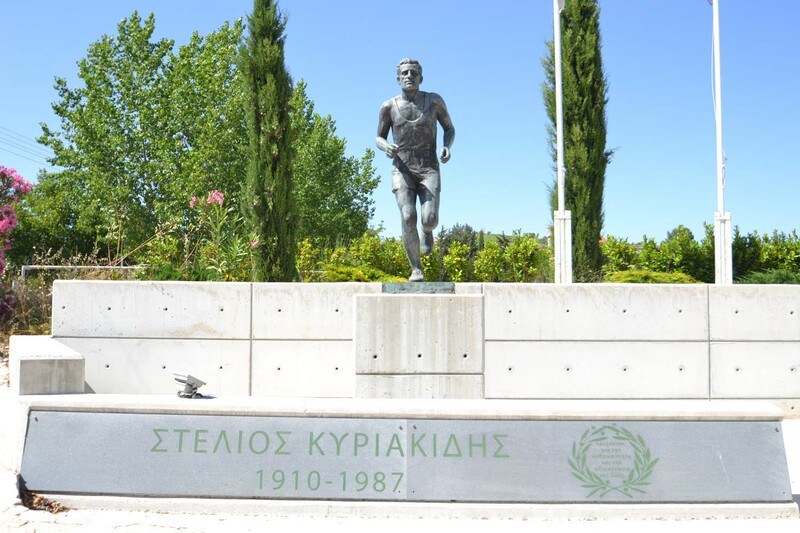 We welcome you to the home town of our marathon runner, the person you lifted Greece during a tragic period for Hellenism, our great athlete Stelios Kyriakides. Our land is hard and tough, and daily struggle is needed for survival, blood and sweat as well as patience and good soul that helps overcome difficulties and obstacles. These were the peculiarities of Stelios Kyriakides soul, who left our village at a young age to work and train. His talent, his hard work and mostly his strength were the main components of his success on a universal level. 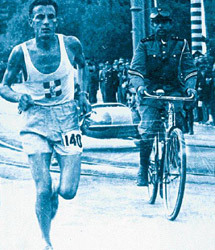 His major win as an athlete and a person was during the Boston marathon in 1946. His goal was not only an athletic win, which was a great one, but also something deeper, something purely humanistic. As an original Greek soul, he strived to help all Greeks that were literally starving to death. He fought to gather material assistance and helped boost the morale of the Greek nation that has just came out of the II World War. And he accomplished that. He became a paradigm of a person that can resist hunger and medical reason and defeat them, as his soul was aiming high. Johnny Kelly, his co-athlete and main opponent, said right after the race: “how can you defeat such a man? He was not running for himself, he was running for his country”. The message sent by Stelios Kyriakides is beyond the track. It is a message of life and struggle, indicating that humans have unlimited potentials when they aim high. Let us keep that message in our souls.